Published by Cyril Huze December 15th, 2016	in Chassis, Customs and Editorial. 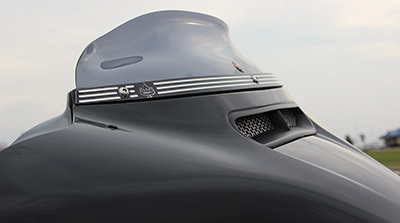 The hard-coated polycarbonate windshield, with its patented hips and flip, have revolutionized the air management market, and thousands of riders around the globe sing its praises. It improves stability and creates a nice, clean pocket of air that reduces wind-buffeting. I love my Klockwerks Flare windshield on my FLHX. It’s always the first thing I do when I get a new bike. Roadking riders should also try one. They are great on Roadkings.